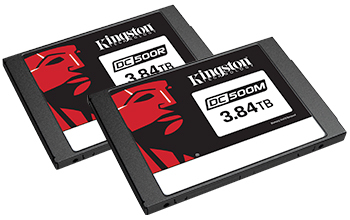 Fountain Valley, CA – March 25, 2019 – Kingston Digital, Inc., the Flash memory affiliate of Kingston Technology Company, Inc., a world leader in memory products and technology solutions, today announced it is shipping the Data Center DC500M Enterprise SSD optimized for mixed-use workloads. This is the second drive in the DC500 series that implements Kingston’s strict Quality of Service (QoS) requirements to ensure predictable random I/O performance as well as predictable low latencies over a wide range of read and write workloads. Last week, the company began shipping its DC500R SSD optimized for read-centric applications. Workload based on FIO, Random 4KB QD=1 workload, measured as the time taken for 99.9 percentile of commands to finish the round-trip from host to drive and to host. Measurement taken once the workload has reached steady state but including all background activities required for normal operation and data reliability. Total Bytes Written (TBW) is derived from the JEDEC Enterprise Workload (JESD219A). Drives Writes Per Day (DWPD). Limited warranty based on 5 years or SSD “Life Remaining” which can be found using the Kingston SSD Manager (kingston.com/SSDManager). A new, unused product will show a wear indicator value of one hundred (100), whereas a product that has reached its endurance limit of program erase cycles will show a wear indicator value of one (1). See kingston.com/wa for details.